I believe that every baby born is special. So imagine my horror when I heard of the ‘fish and chip’ babies in Africa. Born into a life of extreme poverty and many already infected with the HIV virus, these innocent newly borns are wrapped in newspaper and sent home...they are known, as the fish and chip shop babies. We recently flew over to Ireland to visit some friends and were humbled to see the work they were doing to help the children in Africa. 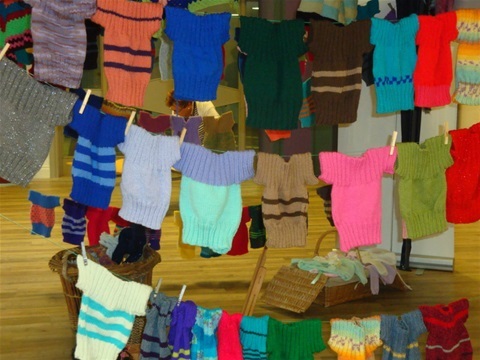 They had put together a team of people who knitted tiny, colourful jumpers for the fish and chip shop babies. These jumpers were no bigger than the ones we use for the rescued hens, back at our home for waifs and strays. Use double knitting wool and 4mm needles, cast on 44 stitches. Next row: Rib 21, cast on 26 stitches, rib 21 (Please cast these stitches on loosely, using one size bigger needles if necessary). Cast off. Sew side and sleeve seams.